s a natural-looking partial set of custom teeth that is used to fill gaps left by missing teeth. People wear dentures to improve their appearance and comfort while eating. They are designed to rest comfortably on the existing teeth and gums & can help to restore the natural contours of the cheeks, lips, and face. In severe cases of missing teeth, partial dentures offer major improvements by filling in the gaps left by these teeth & can even make a patient’s smile look completely normal again. This can do wonders for one’s self esteem and can greatly improve the comfortability & chewing ability of the individual. As opposed to a Full Denture, a partial denture is a solution more for the individual who is missing only a few teeth rather than all or most of them. Alternatively, Dental Bridges and Dental Implants can be utilized for a more permanent, unremovable solution instead of getting dentures depending on your dental circumstances. They are easier to maintain, but are often a more expensive alternative for treatment. There are two main categories of partials: removable and irremovable types of partial dentures. 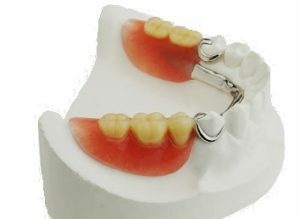 Removable partial dentures are the most commonly seen, and within this category there are 3 subsidiary types of dentures: Cast metal (metal frame), Acrylic (plastic), and Flexible Acrylic (flexible plastic clasps). Partial dentures also offer benefits in reducing the impact that missing teeth can have on your mouth. Visit the Oxnard dentist with over 45 years of experience working in Cosmetic Dentistry – Carson & Carson, DDS. to fit your exact dental circumstances starts between 8 to 12 weeks after the teeth are lost or extracted from your mouth. A mold of the mouth tissues is taken and models are created based on this mold. 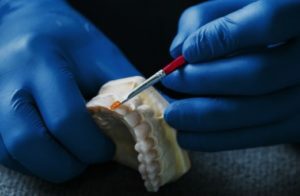 The dentures are constructed piece by piece on this model and then tested with the patient’s mouth to ensure that they will work properly when used. This step of the process takes about 4-5 weeks on average with a visit to the dentist once a week. It is important to revisit your dentist and have the dentures adjusted if they are causing any discomfort or irritation along the oral tissues. It takes time to adjust to a partial denture designed to replace your missing teeth. You may have difficulty chewing or speaking properly at first, but over time this will become easier. It becomes easier over time to insert and remove the partial denture from your mouth. The denture should always fit into place with relative ease. If it must be forced into place or is persistently irritating to your gums or teeth, it should be taken to your dentist for readjustment & finetuning. Cheap dentures may be a quick fix, but taking the time and money to invest in a set of high-quality dentures is almost always more worth it in the end. Brush twice a day using a fluoride toothpaste and a soft bristled toothbrush or one made specifically for cleaning dentures. Hard bristled brushes can damage the delicate surfaces of your dentures. Wash your dentures well after cleaning them with denture cleaners because they can contain unwanted chemicals. Be wary of using toothpastes on your dentures as some can contain abrasives that can damage the surface of dentures. When washing your dentures, hold them over a towel or sink full of water. Dentures are surprisingly more delicate than normal teeth and can break or shatter easily if dropped. Visit our partial denture case studies page to see more. This patient only kept his two front teeth, rather than have a complete full denture. By doing so, he was able to chew all the hard foods that full denture wearers can only dream about i.e. carrots.